Ha deciso di fare un barattolo 3D, dopo aver visto quello fatto da me alcuni mesi fa. Con la fustella di Tim Holtz Tattered Florals ha tagliato un piccolo fiore di foam glitterato color prugna. Aurora ama le cose semplici e ha optato per poche decorazioni (al contrario di me, che non riesco a smettere di aggiungere bits and bobs... :D LOL): ha aggiunto solo alcune mezze perle e un piccolo cuore per accentuare il luccichio e impreziosire le forme. Aurora has learned from you so well, and this jar proves it! The glitter looks amazing and so very pretty. 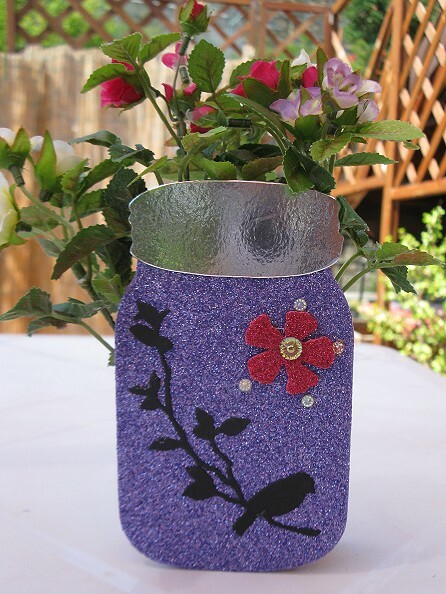 Both sides of the jar look fantastic, and this little girl definitely has an eye for design! Well done Aurora!!! Beautiful work from a lovely girl. Aurora is obviously talented and has learned from an expert. Well done - thanks for sharing this gorgeous project with us at Unstampabelles. Provando ancora una volta come Blogger sembrò perdere il mio commento. 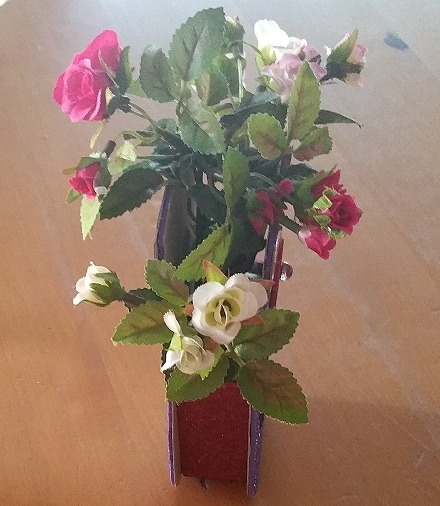 Che un super vaso per i tuoi fiori e così frizzante con una bella farfalla. Il tuo nipote Aurora è una bella ragazza e le unghie abbastanza dipinte. Abbiamo avuto una bella vacanza e Venezia era bello come sempre. Grazie per le gentili parole, quando ero via. Gorgeous vase of flowers Aurora!! the whole design of this is absolutely stunning! I am sure your Mom will love this, so pretty and the flowers are beautiful too. Love this vase - Aurora is certainly following in your footsteps Alic. The sparkle is so pretty, love the fact that it's actually a container as well. Beautiful work! Hope she wins. I have some candy on my blog if you'd like to join. WOW, Aurora! She did an amazing job! I LOVE this! I love the sparkle and this is awesome! I like how she used the recycled products to make it strong and sturdy - she learned this from you! 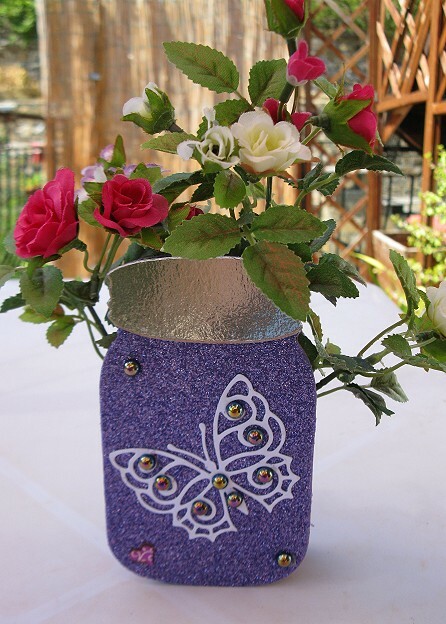 I like the die-cut butterfly and flowers and I LOVE the real flowers inside the jar/vase - it really makes an impact! Well done, Aurora! Keep crafting - you are very talented! Your young niece has a bright future in card and paper making! She's a got a great eye for colors and details, I would think many young ones tend to overload or not adding enough, but this is perfectly balanced. Totally glittery and shimmery. I'm sure you must be so proud of her. and her mum must be so excited to receive this beautiful gift! 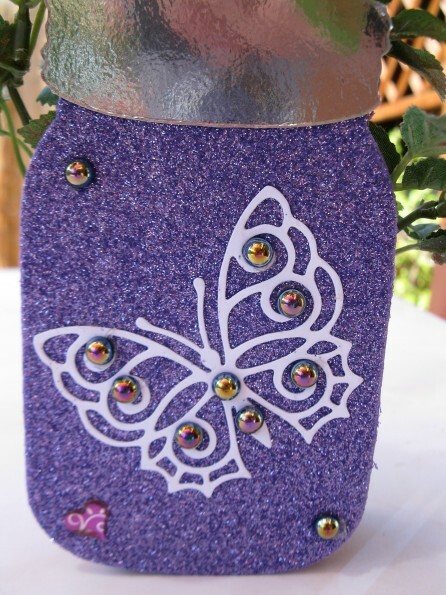 Your niece has created a fabulous card, such a great design with lots of lovely sparkle. Oh this is gorgeous Aurora, love the all the sparkle and in my favourite colours too. Thank you for joining us at Simon Says Stamp Children's Challenge. Nipotina Aurora has inherited your talent. Her project is amazing... and what a clever idea it is. You must be so very proud of her, Alice! I can't wait to see what else she has in store for us. So glad that you join the fun over Simon Says Stamp “Summer Vacation: Kid’s Challenge” Challenge! Awesome details and design! Super work! Wow, this is a clever project, and Aurora, you did such a beautiful job with it. I love it! 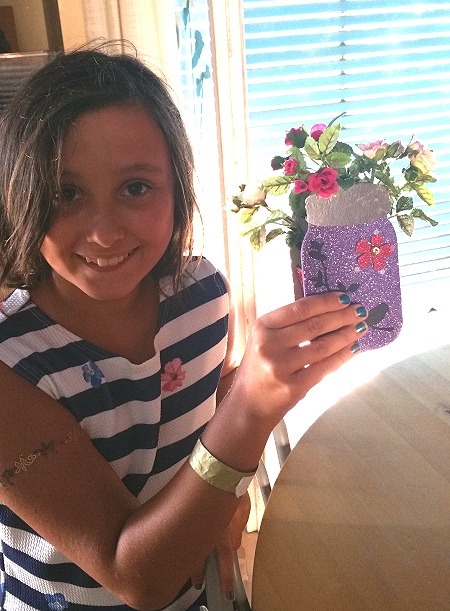 How lovely that Aurora enjoys to craft with you Alice, she did a great job - it's gorgeous... and very SPARKLY!! Wow, Aurora! Your jar is amazing and I love all the glitter. Great job! In bocca al lupo ad Aurora bellissimo vasetto.